Time to Get Dolled Up! I am excited to introduce the new Dolled-Up Birthday Kit–voted on by SU! demonstrators via our Facebook page. This gorgeous birthday card was created by Chris Gilmore, a manager from Coshocton, Ohio. Congratulations, Chris! Feel free to visit my website and place your order for this FANTASTIC kit! This is available for a limited time only!! If you are a regular customer of mine, consider adding this to your order! Place the stamp on clear-mount block D or H rubber side up and ink with the Soft Suede Classic Stampin’ Spot. Stamp “Happy Birthday” at the bottom of the card front. 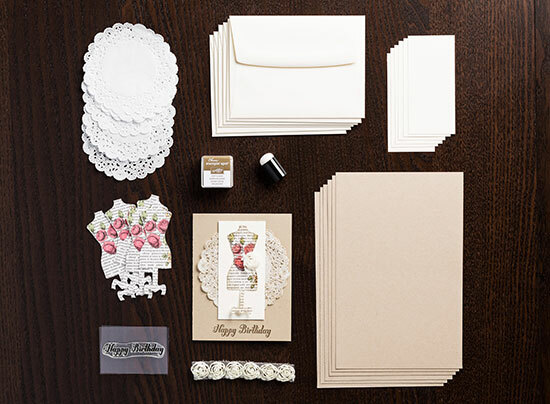 Ink the Sponge Dauber with Soft Suede ink and gently antique the doily and the edges of the dress form.